The Citizens Coinage Advisory Committee (CCAC) met on November 29th, 2011, at the United States Mint’s headquarters in Washington, D.C., to review and discuss the revere design candidates for the 2013 America the Beautiful Quarters. In attendance from the CCAC were Chairman Gary Marks, Dr. Doreen Bolger, Dr. Michael Bugeja, Arthur Houghton, Erik Jansen, Michael Olson, Michael Moran, Mike Ross, Donald Scarinci, and Heidi Wastweet. Representing the Mint were Kaarina Budow, Don Everhart, Andy Fishburn, Ron Harrigal, Leslie Schlager, and Greg Weinman. Mr. Harrigal provided an overview of the America the Beautiful Quarters Program, followed by a presentation of the reverse designs for the five sites being honored in 2013: White Mountains National Forest, Perry’s Victory and International Peace Memorial, Great Basin National Park, Fort McHenry National Monument and Historic Shrine, and Mount Rushmore National Memorial. The primary points of discussion for the White Mountains National Forest designs centered around the use of wildlife; the moose is too common to other states to be used, and the deer and bird devices would fade away on the scale of a quarter. 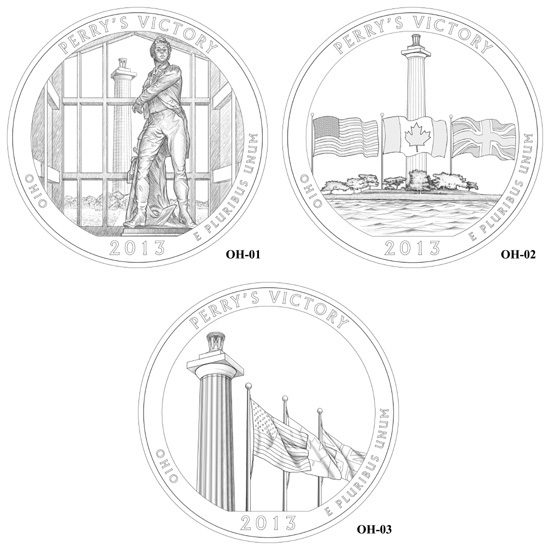 For the Perry’s Victory designs, the use of the Canadian and British flags on an American coin was met with considerable dislike by the committee members, as well as only being given three designs to review. The designs for the Great Basin National Park were given relatively high praise, aside from some comments of caution regarding the foliage elements. During the discussions around the Fort McHenry National Monument and Historic Shrine, the committee members noted that the designs are more focused on the fort, rather than on the actual battle that Francis Scott Key observed which inspired him to write the Star Spangled Banner. 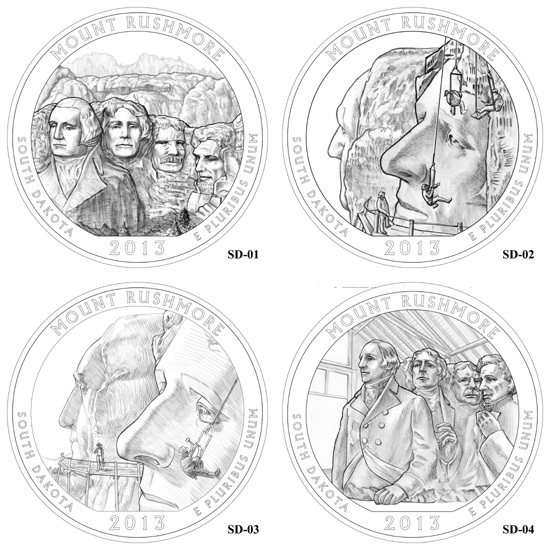 Mount Rushmore proved to be a challenge for the artists, as it had been recently honored on the South Dakota State Quarter. ** A motion to reject all of the designs for Perry’s Victory passed 4-3. 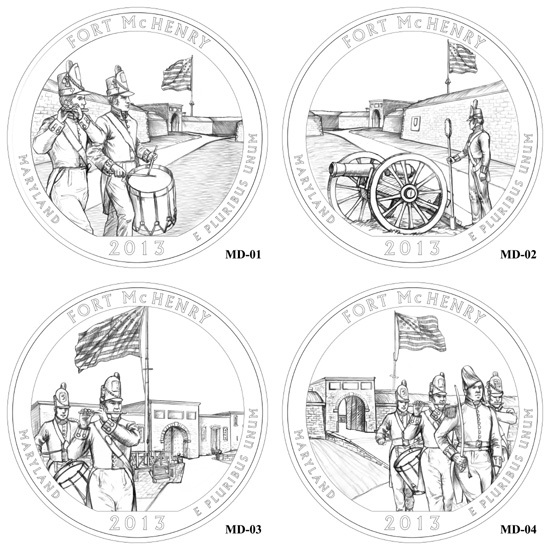 Editor’s Note: On February 28, 2012, the Citizens Coinage Advisory Committee will review a new set of design candidates for the Perry’s Victory and International Peace Memorial Quarter and the Fort McHenry National Monument and Historic Shrine that have been prepared by the United States Mint. I am a buyer of the moose coin NH-05, probably wont get minted though!! Also i do like the Mount Rushmore SD-01……both these coins would look awesome with the DMPL!! I will most likely pass on the rest of them! 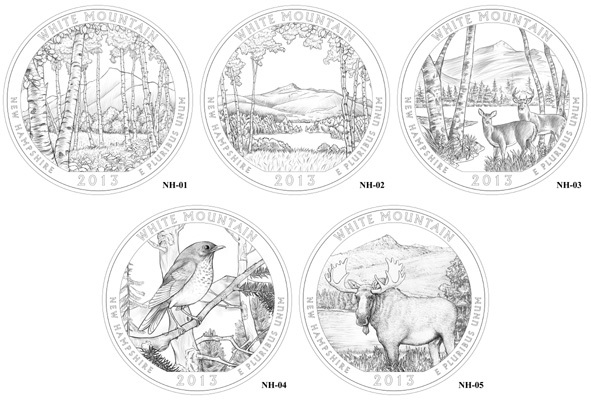 With the exception of the White Mountain coin, I am not that thrilled with most of the designs. The White Mountain coin is excellent, though. Thanks for the update on this, Les. I love the choice for White Mountain Nat’l Park!!!! Excellent! Great Basin…. all designs excellent!!!! tough to choose best! Fort McHenry… not there, the soldiers look like they are keeping busy drilling… need British warships offshore in the distance. Mount Rushmore … Good choice… other designs remind me of the Lilliputians snagging Gulliver in Jonathan Swift’s “Gulliver’s Travels”! and SD-04 looks like they are lined up in the men’s room! Way too boring for my taste! The only two designs that even comes close to really capturing a Nat’l Park feel is NH-05 and SD-01 design and even then the moose would be a better fit in the NH-03 design in place of the deer, and the Mount Rushmore SD-01 would be a better display if it were to show a portion of the visitors center in the foreground as oppose to the mountain ranges shown in the background. 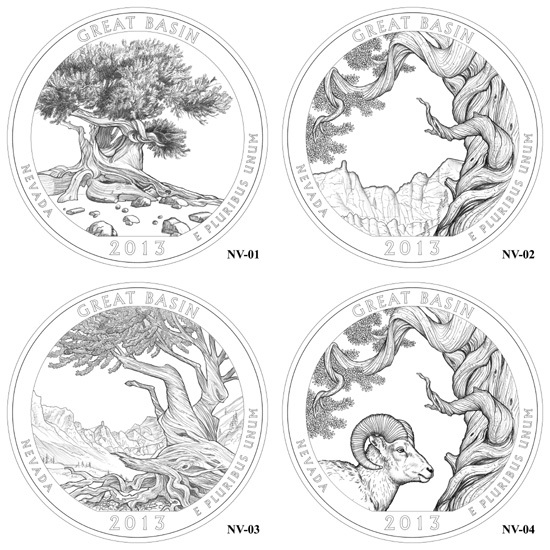 Other than those two possibilities, the designs for the 2013 America the Beautiful Quarters is poised to become a lackluster year seeing things from a collectors point of view. Since this is a rerun column, should have waited after the CCAC meeting, so we can all get a gander at the new OH and MD proposed designs. Just a rehash of what the CCAC decided last Nov. Unfortunately the designs are generally uninspiring and insipid compared this year’s iconic designs. I’m a buyer of the 5oz Silver Bullion Coins, and the only designs above that would look good on a big slab of pure silver are NH-01 and NV-03.